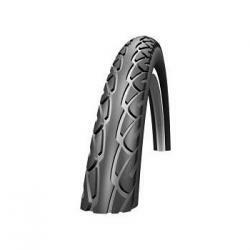 This is a tyre that gives the touring and recreational cyclist an oppotunity to ride one of the most outstanding easy running tyres for high mileage and optimum safety. It is made from a silica compound, has a modern tread pattern and a Kevlar Mountain Bike puncture protection belt that offers complete reliability. It also has a Scotchlite reflective material along the the sidewall of the tyre that provides unparalleled safety at night.